Given the front and center nature of energy conservation these days, the request for a list of all the current model cars achieving an average of 30 mpg would be a snap. Simply search for that list and post a link to the answer. No so. At least not in the 20 minutes I spent Googling and Binging for it. Lots and lots of sites where you can find a partial list, but only if you drill down to each car individually. Of course this is the perfect scenario for the self-building list technique. 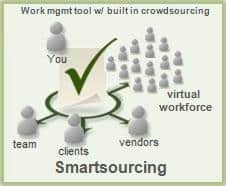 Simply publish the list to the web, and then offer $0.10 to any Smartsource worker that can add a car to the list not already present. Feel free to Add a Car to List that we’ve collectively missed. Enjoy. I'm glad I saw this post. I was planning to buy my own car and this is the kind of post that'll help me choose the right one. Thanks for sharing! car, I'd like the year, make, model, and URL to supporting evidence. I am working on an application and need to understand how car rental companies move their cars from one location to another when there are too many cars left by customers at one location. One way is to give dirt cheap one way rental offers to customers originating some specific location. However, I am trying to understand do they use auto transport companies to do this for them? If yes how much business auto transporters get one average from such scenarios? Also, do car rental companies have some sort of contracts with auto transporters saying they will move rental cars always or on demand basis? Toyota is recalling certain model year 2010 Toyota Prius and Lexus HS250H passenger vehicles. Customers have experienced inconsistent brake feel after ABS actuation during slow and steady application of the brakes on rough or slick road surfaces. Stopping distances may be increased compared with a customer's expectation for a given pedal force. Vehicle stopping distances may increase relative to a customer's expectation increasing the risk of a crash. Dealers will rewrite the programming of the ABS control unit free of charge. I Have seen in many part of the transportation blogs and papers that a customer or a manufacturer mostly focuses on the MPG factor is it not a model or a company. of course not i guess everywhere in the world people focus on the MPG. so today once again going through your blog proves it. A lot of the MPG you get from your car depends on how you drive it, I was speaking with a guy a week ago who saw my car and asked about the mileage as he had hired one and he was getting about 10 miles to the gallon less than me. Sensible things like not revving the engine or not pulling away quickly from the lights will help as do ensuring your tires are properly inflated. The trend from manufactures will always be to get more MPG from the car. With the price of fuel constantly rising, it is best to consider which car has the lowest gas mileage. Your list is helpful for those who are planning to buy new vehicles. This can help them save a lot of money from unwisely buying a car that eats so much gas.